Mac OS X version 10.6 or later, Mac OS X (Core Audio) compatible audio output. 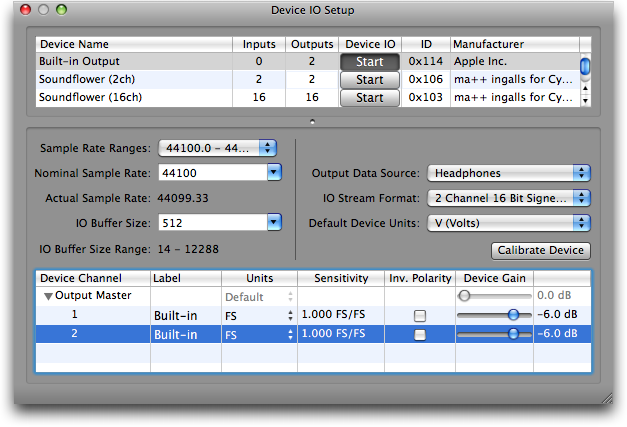 SignalSuite is a real time audio signal generator, takes advantage of Mac OS X compatible audio hardware to produce white noise, pink noise, or any of several periodic signals. Fix for plot freezing issues on Mac OS 10.9 (Mavericks). Fix for a potential crash in the Signal Generator tool. Bugfix for halted live updates of bar meters and fixes a bug that could potentially cause the app to crash. Up to two stereo signal generators may be added to a project. Version 4 includes various other improvements over previous versions. SignalSuite may now be purchased and maintained through the Mac App Store. Output channels of certain multi-channel audio interfaces, such as the MOTU UltraLite mk3, are properly enumerated. Audio device channel gains on certain devices, such as the Wavelength Proton USB DAC, are properly restored when opening project files.